In 2003, when windows of stained glass were removed from the former New Monumental Baptist Church on Eighth Street, they were carefully handled, treated as what they were: Reminders of what the church meant to local residents and church members. Monumental moved to its current location at 901 Woodmore Lane after the University of Tennessee at Chattanooga purchased the Eighth Street location. Even as the old building was being torn down to expand the college's footprint, UTC officials understood the history of the church and its familiar stained-glass windows on the second floor. The unbroken pieces of stained glass were later distributed to nearby businesses. "When we negotiated with New Monumental, we were sensitive to its historical value and what that church meant to the area for many, many years," John Schaerer, dean of Metropolitan College at UTC at the time, told the Times Free Press. "It had a lot of sentimental value connected with it." In many communities, stained-glass windows are a comforting sight, even for those who aren't members of the particular church. They're often a longstanding image of a neighborhood, both permanent and ever-changing. They can't be easily moved from their frame or rearranged, but shifting sunbeams affect what each new admirer sees. "Stained glass brings light and color and story into a building at the same time," says Virginia Chieffo Raguin, an art history professor at the College of the Holy Cross in Worcester, Mass. "No other medium does that." "In the 20th century, you get lots of secular buildings with stained glass: subway stations, schools and shopping malls," Raguin says. Utah Valley University joined this secular stained glass movement, which often draws on storytelling techniques associated with religious displays. Officials recently unveiled an 80-panel stained glass project along the front of the university's campus library. "Roots of Knowledge," which required almost eight years of research, fundraising and labor from Utah Valley leaders and artists, aims to capture the various sources of human knowledge, including science, literature and the world's religions. If stained glass often tells a story, these windows contain a multi-volume epic. "I loved the idea of taking this ancient art form and channeling it into something that's appropriate for a modern, secular institution," says Utah Valley President Matthew Holland. Exhibits like "Roots of Knowledge" honor the rich history of stained glass artwork, while creating designs that speak to contemporary audiences, experts says. The subject matter doesn't have to be religious for stained glass to move people deeply. "For some people (their response) will be intellectual. For some people, it will be aesthetic. For some people, it will be spiritual," Holland says. "It will reach people in different levels and ways. That's what I think great art always does." But it's long been associated with religious buildings because faith communities were able to commission pieces when the medium was first becoming popular, says Terry Bloxham, a stained-glass expert who works at the Victoria and Albert Museum in London. "Many innovations in what we would now call the 'decorative arts' began in churches. Decorated windows, tiled floors (and) painted walls were expensive to produce and the church seems to have been the only institution in the West able to afford these arts," she says. Religious buildings were frequented by the whole community, which meant that everyone benefited from efforts to beautify them, Raguin says. "The religious building was the most important building in the city, even beyond the king's chapel or the king's buildings," she says. "Unlike today, everybody in the city participated in (religious life) — the nobility and the merchants and the clergy and everybody else." Additionally, stained-glass windows helped faith communities express their identity, Raguin says, noting that "unlike regular art, like paintings, that can move from place to place, stained glass has to be made for a specific place." In 2005, for instance, St. Bridget Catholic Church in Dayton, Tenn., held a celebration to dedicate its new stained-glass window depicting St. Bridget, the patron saint of the church. The window also showed the altar crucifix and had panels that replicated the church's original 1968 stained-glass window design. Across churches around the globe, leaders often meet with a stained-glass artist to decide how to feature a local saint. The process required research and debate. Community-specific windows would be paired with others that depicted familiar Bible stories. "People just didn't say, 'OK, John, go ahead and do some windows.' You had the archbishop, the head of the chapter of monks, all these people" making decisions about the windows, Raguin says. Stained-glass windows continue to have spiritual meaning for many believers, especially those who view light as a symbol for the divine, says Ashlee Whitaker, curator of religious art at Brigham Young University's Museum of Art. "I think anyone who goes into a space with stained glass can feel some of that radiance," she says. "I think there's something really magnificent about the idea of creating an image where light makes it come alive." "In a space like we've created here, it connotes that aura of worship and reverence," Whitaker says. 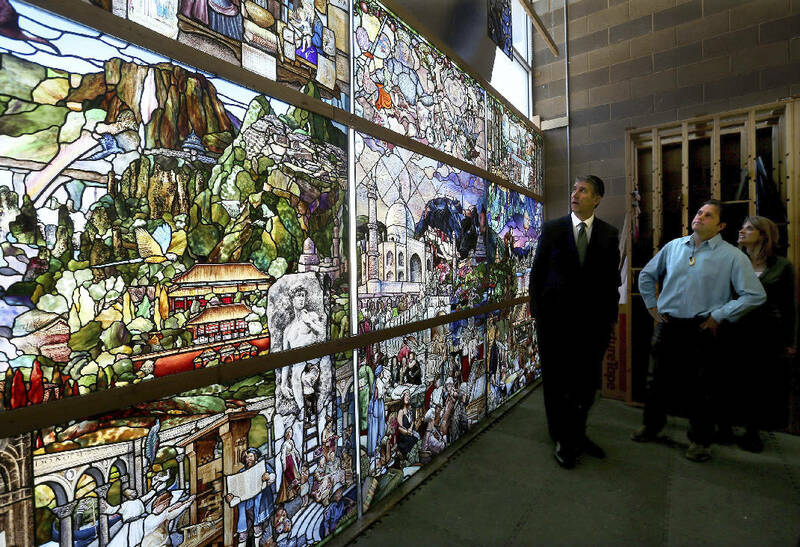 Religion-related projects still occupy many stained-glass studios, but there's growing interest in pieces for secular spaces, says David Judson, the first vice president of the Stained Glass Association of America. His Los Angeles company, Judson Studios, is working currently on two church projects, but also pitching a design for a dome window on a cruise ship. "It's a very diverse world out there, but we are seeing a trend of glass being more acceptable or respected in a secular world," Judson says. "It is a magic experience to enter a building, religious or secular, and be bathed in colored light," Bloxham says.